Big news: We're in the middle of moving to California! More about that soon, plus sketches from my "jobmoon" trip to Italy. The past several weeks have been a whirlwind of prepping, packing, list-making and house-hunting, so on Saturday I took a few hours off to meet up with the South Bay Urban Sketchers. 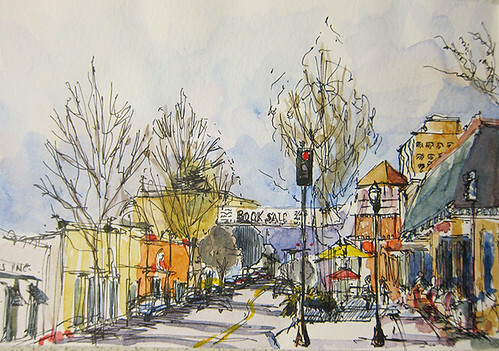 We met at Red Rock Coffee Company in downtown Mountain View and then wandered down Castro Street with our sketchbooks. It was a great way to start the weekend! The east coast will miss you! All the best with the move. Love your street view!